Here's How You Can be The Most Adventurous at The Andaman And Nicobar Islands. Who doesn’t like to holiday among clear turquoise waters, pristine white sands, unspoilt beaches, stunning rainforests, gorgeous corals and palm-fringed coastlines? Nobody, right? Andaman and Nicobar Islands is India’s very own tropical paradise in the truest sense of the term, located about 1,000 kilometres off the eastern coast of India in the Bay of Bengal. With a rich flora and fauna cover, Andaman and Nicobar Island is sure to blow your mind. If your idea of a perfect vacation is to enjoy nature and revel in adventure activities, this is where you must head straight away. 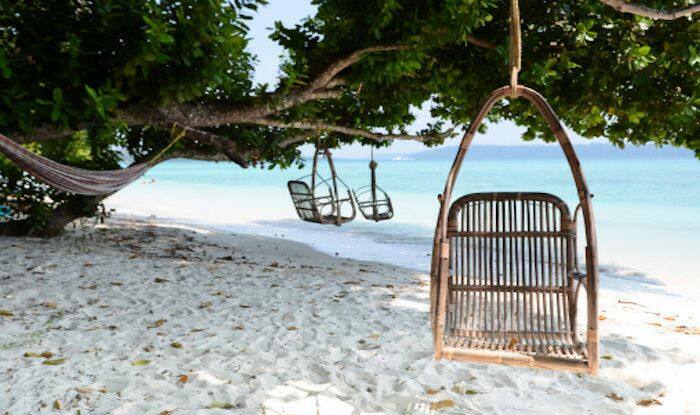 Of course what’s a trip to Andaman without beach bumming on the gorgeous beaches there. Laying on beaches like Radhanagar Beach and Elephant Beach, sunbathing, sipping on a fruity cocktail is perhaps what dreams are made of. And when you’ve has enough of that, you can indulge in water activities such as swimming, snorkelling, scuba diving, banana boat rides, parasailing, underwater walking, and jet skiing. The most adventurous would be to go for dolphin watching; there’s nothing quite like it. Jolly Buoy Island or Red Skin Island is the best for exploring the multi-coloured coral reefs that Andaman is famous for. You have got to have this on the top of your bucket list; they’re breathtakingly beautiful. Another big attraction in Andaman is the underwater walk at North Bay Island and Havelock Island. You wear a helmet that lets you breathe normally and then you sea-walk among the corals and the fish. Imagine fishes floating around while you are walk in their ecosystem; truly an experience of a lifetime. For those who love avian life, and enjoy birdwatching as much as anything else, Andaman’s bird island or Chidiya Tapu is a verdant spot with forests and mangroves that house numerous species of birds. The constant chirping, birds in all colour, shapes and sizes flying from one tree to another – is just amazing to watch. Look out for parakeets, drongos, doves, and eagles that have made this island their home. You wouldn’t normally associate Andaman with trekking but Madhuban (20km from Port Blair by ferry) is the perfect spot for the sport. Lush green forests, several indigenous flora and fauna and breathtaking natural beauty make Madhuban an adventurer’s delight.